I was up until midnight working and I’m back to work at 7 this morning. I wish I could say that I was “working” on I,Q 2 until midnight, but I wasn’t…at least not all that time. I had to spend several hours getting my calendar set for the next few weeks of speaking engagements. It’s hard for me to relax until everything is set in stone (more like putty) on my iPhone. I plugged the phone into the computer to sync it and found out there were several things to download, including a new iPhone operating system. I had to also straighten out some glitches with my calendar and contacts (a lot of my contacts disappeared into the Ethernet). I got “most” of them back. Marie actually books all of my speaking engagements, flights, and hotels. She spends a lot more time figuring all of this out than I do, but it amazes both of us how much time this takes after all these years of doing this. I’d guess that it takes four or five hours of preparation (not counting the travel) for every hour I speak. Okay… I know this is all a little boring and maybe a little whiny, but I mention it here in case some of you are under the false impression that authors are somehow immune from tedium. I did get some done on I,Q 2 after I got the schedule set, but about 11:00 my brain seized with fatigue, so I finished reading “Saucer” (which I liked) as that little green downloading bar inched a very slow course from left to right across my laptop screen. Fabian, the tile fellow, was here bright in early with his skill saws, drills, and tile cutters to start on the kitchen counters. He was here all day and he’ll be back tomorrow. On Wednesday the final kitchen cabinet is supposed to arrive and they’ll hang the rest of the cabinets, which means that Marie and I will have approximately 12 hours to enjoy this remodel before we head up north. I think this is the fourth of fifth time we’ve been without a kitchen sink. This watch plays an important role in IQ2. Author’s (at least this one) tend to use the things they like and use, in their novels. I can’t tell you what role this little beauty plays, but I can say that the watch is also called the “James Bond Watch.” The James Bond in Ian Fleming’s novels actually wore a Rolex. 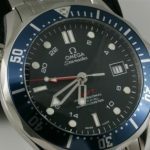 But in the later James Bond “films” OO7 wears a Swiss made Omega. Good Morning Roland, I think that one of the best parts about meeting you is that you actually are a “real” person. Problems, conflicts, tedium, kitchen sink loss. But yet, still able to write incredible books in spite of it all. (With Marie’s help of course! )The best part of your books to me, is the amazing amount of determination you put into each one. I can read it on each page.